We’ve ticked over the billion-dollar milestone for total value of wool sold this year which is something of an achievement. At this point in the season last year the value was 26% lower than it is today despite the cumulative bales sold being just 10% lower. The wool market hasn’t reached this mark by week 17 since 2002. The Eastern Market Indicator (EMI) rose 10¢ on the week to 1,578¢ in Australian dollar terms. However, the falling Australian dollar has put some real pressure on the EMI in US dollars. It saw a drop of 13¢ to the week back to 1,218¢. This is a win-win situation, with Australian sellers receiving a higher local price and overseas buyers getting more “wool for their buck”. The Western Market Indicator also supported by the shifting currency by rising 20¢. Sales were fairly strong across the board, with the real achievers again being in the fine wool category. Wool 19 MPG and finer gained between 35 and 45¢ in the Northern market while similar rises were only received for superfine wool (16.5 MPG) in the Southern Market. Premiums for fine fibres over medium fibres this season have been significant- Figure 1. Prices across the rest of the Merino market were generally positive, rising on average 10 to 20¢. Crossbred fibres took another hit this week as all buyer interest seems to be mounting on finer fibres. Price reductions were mostly between 20 and 40¢ while the better prepared lines managed to attract a little support. The skirtings market had another solid week seeing gains of 20 to 50¢. Buyers were particularly happy to pay more for low vegetable matter. Cardings indicators rose 30¢ on average across all three markets. 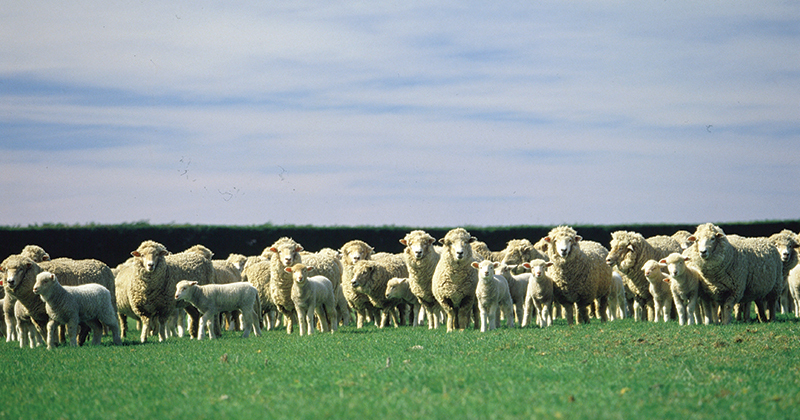 The response from growers this week was to pass in 3.2% of the offered wool, resulting in 43,473 bales sold. This is a slight retraction on last week but still considerably higher than last year. 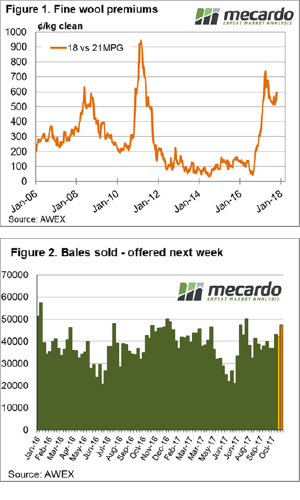 47,266 bales are rostered for sale next week across the three selling centres (Figure 2). Melbourne is set for an extra day of sale on Tuesday, while Sydney and Fremantle are operating Wednesday and Thursday as usual.